Welcome to my blog, which features frequent updates on local Takoma Park issues, including City Council meeting agendas, plus occasional commentary on national news and politics. 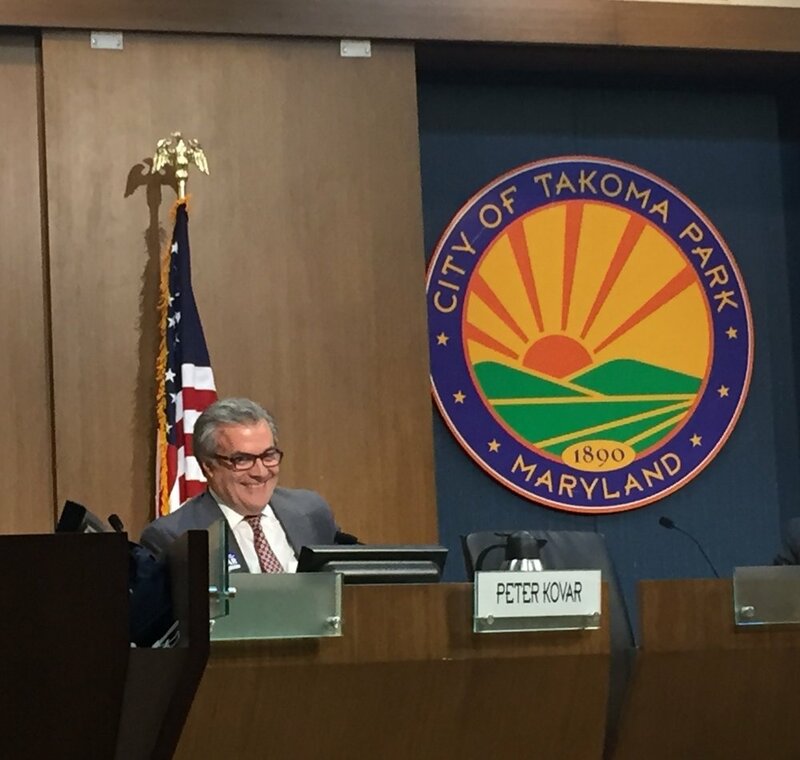 Here’s a link to the March 20, 2019 City Council meeting agenda: https://takomaparkmd.gov/meeting_agendas/city-council-meeting-agenda-wednesday-march-20-2019/. The agenda includes votes on the Plastic Straw Ordinance; a resolution on the proposed Montgomery County Accessory Dwelling Unit (ADU) Zoning changes; and appointments to the Façade Advisory Board appointments. I would like to hear from residents especially about the proposed ADU changes. There will also be two important presentations: from architect Greg Lukmire on the Library Renovation, and from the Neighborhood Development Company (NDC) on the Takoma Junction project. The Mayor will also be issuing three proclamations: on MeatOut Day (March 20), Love Your Local (March 30), and Arbor Day (April 6). I’ll provide more details on Love Your Local and Arbor Day in a future message. Takoma Junction Development Review Committee meeting. The meeting will be on March 19 at 9:30 AM at the Montgomery County Planning Office, 8787 Georgia Avenue in Silver Spring. The meeting is open to the public, but there’s no opportunity for public comment. See below for more details about this meeting and the status of the project and recent updates. Coffee with a Cop. On March 21 from 10:30 AM - Noon residents will have an opportunity to mingle informally with members of the Takoma Park Police Department at Cameron Rotisserie, which is located at 902 Merrimac Drive. Tree Canopy Assessment Seminar. Residents are invited to attend this half-day event on March 23 in the Community Center Auditorium (morning session 10:00 AM - Noon; afternoon session 1:00 - 3:00 PM). This forum is an important part of our efforts to develop tree canopy goals for the City. The morning session will be a general overview, and will include findings on the current status of the City's tree canopy using 2018 data, which will be presented by University of Vermont Professor Noah Ahles. The afternoon session will be a focused planning discussion on establishing a City-wide tree canopy goal and implementation plan, with Councilmembers and members of the Tree Commission and the Committee on the Environment participating. For those unable to be there, the program will be recorded on video. I won’t be able to attend myself, due to a long-standing schedule conflict on March 23. Stop the Bleed Training. The Emergency Preparedness Committee is offering a one-hour course on controlling severe bleeding due to accidents or intentional harm. The program was created by the American College of Surgeons, federal agencies and military personnel in the aftermath of the Sandy Hook mass shooting. The session will demonstrate ways to control severe bleeding. Participants will receive information on personal safety and protection, use of gloves, and protections under the Good Samaritan Law. Classes, open to City residents age 16 and up, will be in the Azalea Room on March 20 from 7:30 - 9:00 PM; April 13 from 2:00 - 3:30 PM, and April 17 from 7:30 - 9:00 PM. To sign up, complete this application. Library Renovation: https://documents.takomaparkmd.gov/government/city-council/agendas/2019/council-20190320-1.pdf. As part of the work on the proposed new Library, a site survey and an engineering study were completed in 2018. Among the findings are that the Library lies in a 100-year flood plain. This has led the architect to propose some significant design and construction changes, which he will present to the Council. NDC Presentation: https://documents.takomaparkmd.gov/government/city-council/agendas/2019/council-20190320-1.pdf. As mentioned above, on this coming Tuesday the Junction project will be the subject of a County Development Review Committee (DRC) hearing, at which a number of the project’s details will be reviewed in the context of County zoning and development requirements and guidelines. The next day, at our Council meeting, NDC will make a presentation on the current version of their proposal. Based on public and Council feedback at that meeting and in subsequent weeks, and taking into account the DRC review, I anticipate we’ll see further changes to the proposal. Under the current (tentative) timetable, the City Council would vote on the project in mid-May, with the County Planning Office voting on it about a month later. I’ve mentioned previously that the current proposal is between 15 and 20 percent smaller, in terms of the building’s square footage. The reduced size all comes off of the back, meaning that there’s less intrusion toward the green space between the parking lot and Columbia Avenue. The rest of the building is virtually identical to the previous proposal, with no changes along the front façade on Carroll Avenue. I have previously expressed my opposition to the site plan primarily because of what I consider to be an insufficient amount of public space at ground level along the front façade. This is unchanged in the new design, meaning that my concerns haven’t been addressed. My hope is that, as a result of the DRC process and through continued City Council and community review of the project going forward, we’ll be able to bring about some modifications to the project, including a meaningful increase in public space. I don’t know what the chances of that are, but I’ll be doing what I can to explore opportunities along those lines. Plastic Straw Ordinance: https://documents.takomaparkmd.gov/government/city-council/agendas/2019/council-20190320-3.pdf. I’m pleased to be a sponsor of this ordinance to ban the use of plastic straws and stirrers in local restaurants and other food service settings. This is the first vote, with a final vote to take place in an upcoming Council meeting. Under the ordinance, the use of straws made of paper or other non-plastic sources would be permitted. The ordinance also includes language to ensure access to plastic straws for persons with disabilities and others who need them in restaurants that otherwise use non-plastic straws. Accessory Dwelling Units: https://documents.takomaparkmd.gov/government/city-council/agendas/2019/council-20190320-4.pdf. Montgomery County controls zoning in Takoma Park, and the City Council has been reviewing County Councilmember Riemer’s proposed changes to the zoning rules relating to Accessory Dwelling Units (ADUs). The County is likely to vote on the proposal in the near future. This week the City Council will be considering and voting on a resolution expressing our views on the proposal, which we hope to send to the County Council before their vote in order to ensure that we have some input into their decision. Councilmember Riemer’s proposal would introduce more flexibility into the ADU system with the goal of increasing the overall stock of rental units. Among other changes, the proposal calls for reducing the allowable lot size and setback requirements for free-standing ADU structures, allowing the owner to reside in the ADU (with a renter living in the “main” house), eliminating the required distance between two ADUs (to allow for example more units on the same block), and reducing from three to two the number of required on-site parking spaces. I support this general approach because I think it can help lead to there being more rental units in the City, including more that are affordable. But there are some areas of the proposal about which I’m uncertain and that I’m continuing to think about. My preference is to have municipalities (like Takoma Park) make their own decisions on parking, and I’m pleased that idea has been included in our draft resolution. I also may want to look at including in our resolution a clarification relating to how the ADU changes would apply in historic districts, and how and whether setbacks from property lines should be changed. As noted above, I would be grateful to hear from residents with their thoughts on the proposal. Façade Advisory Board Appointments: https://documents.takomaparkmd.gov/government/city-council/agendas/2019/council-20190320-5.pdf. I’ll be voting in favor of these appointments. Please feel free to be in touch with me if you have questions or comments about any of the issues covered in this message. Receive updates on local Takoma Park issues.